The S&P/TSX Composite eased higher by 0.4 per cent for the trading week ending with Thursday’s close and now stands 2.9 per cent higher for 2018. In terms of technical analysis, the benchmark is neither overbought or oversold, with a Relative Strength Index (RSI) reading of 51 that is almost exactly half way between the oversold buy signal of 30 and the RSI Sell signal of 70. There are ten attractive oversold index member stocks this week, according to RSI. Northland Power Inc. is the most oversold company, followed by Maxar Technologies Ltd., Restaurant Brands International Inc., New Gold Inc., Wheaton Precious Metals Corp., Tahoe Resources Inc., Cogeco Communications Inc., Agnico Eagle Mines Ltd., Corus Entertainment Inc. (B) and IAMGOLD Corp. I picked Cogeco Communications as the focus chart this week, primarily because the volatility in the telecommunications market segment has increased significantly over the past year and it’s worth a closer look. 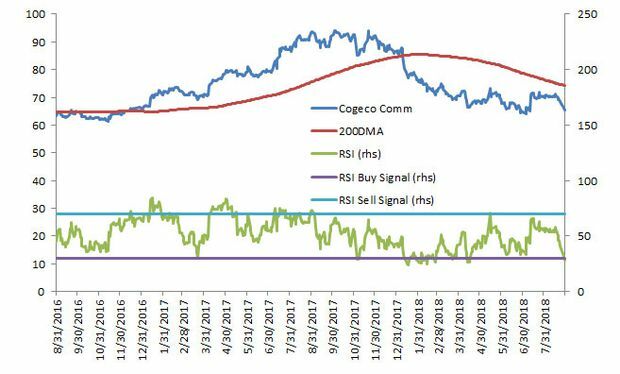 Based on the past two years of performance, Cogeco looks like a case where RSI buy signals work well when the stock is in an uptrend – the price is above the 200-day moving average – and not reliable when the value is below the 200 day. Cogeco stock hit the RSI buy signal briefly in March 2017 and proceeded to jump 37 per cent higher by early October 2017. Another buy signal occurred in November 2017 when the price was still above the trend line, and a 10-per-cent rally followed in the ensuing three weeks. The stock fell below the 200-day moving average in early 2018 and ever since, RSI buy signals haven’t worked at all. Cogeco provided numerous buy signal in January and February but the price barely even paused on its steady path lower. A mid-April buy signal predicted a marginal recovery before another sell-off. Cogeco’s stock price remains below the 200-day moving average which means the current buy signal is not trustworthy. Future buy signals would be far more interesting if the price moves above the 200 day trendline. Fundamental research could very uncover a more optimistic story. Investors should always complete fundamental research before any market transactions. There are seven overbought, technically vulnerable S&P/TSX Composite stocks this week led by Enercare Inc. Canadian Imperial Bank of Commerce, Bank of Montreal, Aphria Inc., ATS Automation Tooling Systems Inc., Thomson Reuters Corp. and Air Canada complete the list.